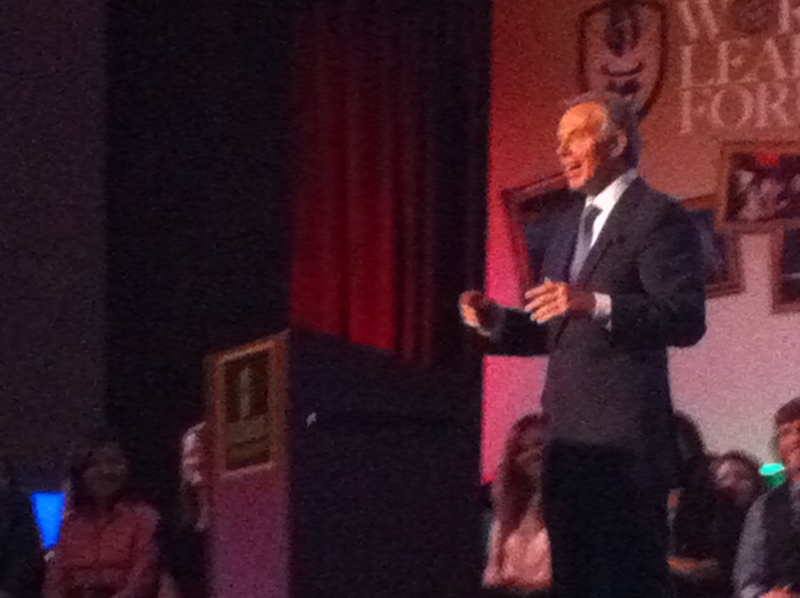 Former British Prime Minister Tony Blair was the keynote speaker at the Judson University 2013 World Leaders Forum. During the program, Mr. Blair answered questions submitted by audience members and shared personal recollections from his long career. He talked passionately about religious freedom, tolerance and embracing diversity as a way of uniting people. Judson University trustee and alum Dr. Nate Adams opened the session with levity mentioning the great lengths the university had taken to plan the wet, cold, damp weather to ensure Mr. Blair felt right at home. Tony Blair lead the British Socialist Labour Party from 1994 – 2007. In 1997, at the age of 42, he was elected Prime Minister of the United Kingdom and served three consecutive terms in this role until 2007. Judson Theology Professor Dr. Darrell Cosden shared stories of the challenges and rewards his family experienced on extended missionary trips to both Scotland and Russia. Cosden first became aware of Mr. Blair when Cosden arrived in Scotland with his wife and one year old son. He earned his Doctorate at the University of St. Andrews in Scotland. He said, “We shape the community and they shape us. Communities have roles to fill. Society exists for the sake of those in it.” Newly elected Judson University President Dr. Gene C. Crume joked that introducing Mr. Blair was quite a cap to his first week in office. Mr. Blair took the stage with a few introductory remarks on the differences between US and British elections. He noted the British campaign season lasts just four weeks. Voting occurs on Thursday and the next day the winner steps into their new role. It is traditional for staff members to line the hallways and shake hands with the outgoing Prime Minister as they exit the building. It is not unusual to see tears flowing during this emotional moment. The newly elected Prime Minister then walks in the front door, again shaking hands with the staff. Mr Blair admitted this was a stressful situation. Mr. Blair clearly had no patience for the United Nations intervention. He said, “My old agenda was entirely domestic before Serra Leone. A group of gangsters toppled the democratic government. If we were to wait for the UN we would be waiting for a very long time. I decided to send in British troops. I am currently working with my charity to help Sierra Leoneget on their feet.” He returned to the conflict in Sierra Leone a number of times during the discussion. Dr. Adams asked Mr. Blair to describe working with Presidents Clinton and Bush during his three terms as Prime Minister. He called Clinton his “political soul mate” and Bush a close political ally who’s countries were pushed together due to war. 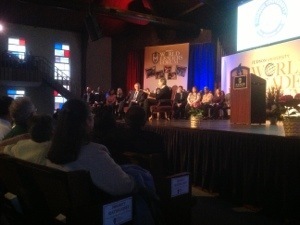 While there was a serious tone to the evening, the Q&A lead to several humorous stories. Established in 1913, Judson University isan evangelical Christian college located in Elgin, Illinois next to the Fox River and near Interstate 90. With over 1,200 students and 60 majors from Management and Leadership to Architecture. This is the university’s Golden Centennial Anniversary, commemorating 50 years since the college’s relocation to Elgin in 1963. 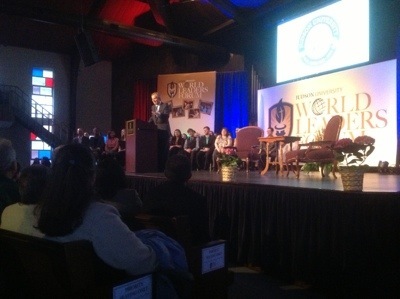 Judson’s World Leaders Forum began in 2011 to “ignite a flame of leadership” for attendees. The program is also a fund raiser for the Judson Student Scholarship Fund. Mikhail S. Gorbachev, 1990 Nobel Peace Prize Recipient and Former President of the Soviet Union was the 2012 keynote speaker. In addition to the community event open to the general public, a VIP private reception and networking event was held. For information contact Jessica Bunn, World Leaders Forum Coordinator.